In Salem, witch will it be: more or less government regulation? Thanks to its notorious witch trials, Salem is already a regular feature in many history classes. But now, with a classic free-market vs regulation conflict brewing in the city, there may be reason to add it to some economics textbooks as well. In 2007, in a move hailed by believers in an unfettered free market, the Salem city council scrapped the limit on the number of psychics allowed to operate in the city. Now some want to reimpose it, arguing that by giving the invisible hand of the market free reign, the town is in danger of being overrun with mediums. While it may not be the most conventional of examples, the dispute is not all that different from the dilemmas cities have dealt with licensing other businesses like taxicabs. In fact, the episode makes for what University of Michigan economics professor Mark J. Perry calls "a good case study of occupational licensing, with economic lessons in barriers to entry, contestable markets, and government regulation vs. market competition." On one side sits Barbara Szafranski, a long-time psychic license holder who wants the cap to be reinstalled. Szafranski believes the city needs to regulate the number and quality of psychics in town. "I'm in favor of putting the cap on because there are so many psychics in the city now," she said. "When I first opened up my business 25 years ago I was just about the only one in this area and, of course, as you're seeing since then it's grown and grown and grown," said Szafranski. Szafranski contends she has lost 75 percent of her business since the cap was lifted, and she hopes the city will do more to prevent charlatans from offering readings. On the other side of the argument sits local warlock Christian Day, who owns two shops in the city. "As a person who believes in the power of the free market," Day said, "I believe that the free market should decide whether or not there are too many psychics. If we have too many, they won't make any money and they leave. It's just like anything else." Day believes popularity, not seniority, should determine who stays in business, and that if "you cap the number of licenses and keep those people with licenses protected you essentially guarantee that people with lesser talent are protected." Anyone who happened to read my post last week arguing that the city of Boston should do what it can to get out of the business of taxicab regulation may not be surprised that I side with Day over Szafranski on this issue. To paraphrase Frank Sinatra, regulating psychics ought to be strictly taboo. 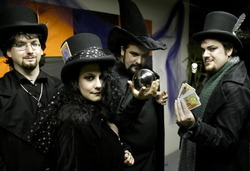 Globe file photo: Warlock Christian Day (far right) and other members of the Salem Psychic Fair in 2005.